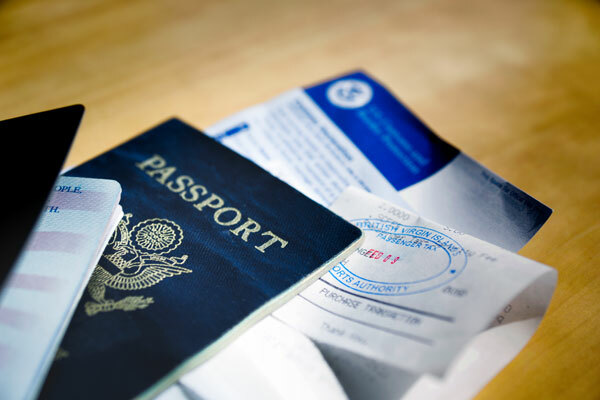 Valid Passport – A passport is required for all international travel, both for entry into a foreign country, and re-entry into the U.S. Err on the side of caution and make sure your passport is valid for at least six months after your travel dates. If your passport is going to expire soon, the State Department has instructions on how to renew it. Visa(s) – A visa is required for many international destinations, and you’ll want to apply at least four to six weeks in advance of your travels. If you do not have the required visa when checking in at the airport, you will not be allowed to travel. Here are the visa requirements for U.S. Citizens. Itinerary – Bring a printed copy of your flight information, as customs officers will need proof of onward travel. You should also have all the details of your tour, including the name and address of your hotel. This information is required for the entry card when you first arrive to your foreign destination. Insurance Documents – Though not required for a trip abroad, bring proof of any international medical and travel insurance you have purchased. Having these documents easily accessible will allow you to respond quickly during any travel or medical emergencies. Credit Cards – Travelers use their credit cards while abroad for purchasing souvenirs and paying for food and drinks. If you intend to use cash for most of these transactions, a credit card is still a good idea for any unexpected costs. Driver’s License – If you plan to rent a car or drive a vehicle in a country outside of the U.S., take your driver’s license as proof that you are authorized to drive in your home country. Print multiple copies – Before your trip, make photocopies of the front and back of all your documents. Pack extra copies in your checked luggage, your backpack or purse, and inside your carry-on on luggage. Spreading them across all your baggage means that if you lose the original or any of your bags, you will still have a hardcopy with you. We recommend leaving a copy with family or friends, as well. Email copies to yourself – In addition to hardcopies of these documents, scan and email these documents to yourself for access to them from anywhere in the world. If your passport or credit card is stolen, you will be asked information like expiry date, card number, passport number, etc. Having these details at your fingertips will save time and make the situation less stressful. Lock your bags – If you are traveling alone, a visit to the restroom or a quick nap gives others the opportunity to take items from your bag. Securing all your bags is the easiest way to protect your travel documents. Keep items with you at all times – Secure your important documents using a travel wallet around your neck, or a travel waist belt. Be extra vigilant in markets and crowded areas. A vacation is meant to be a relaxing time, where you can enjoy the company of new friends, soak up a new culture, and be free of worries. Prepare your important documents properly before and during your travels so that you can fully enjoy your time away without any hassles.